This image is part of the invite and appears to feature a finger tapping an iPad. Apple is expected to unveil the iPad 3, the next generation of its popular tablet, at a San Francisco event on March 7. 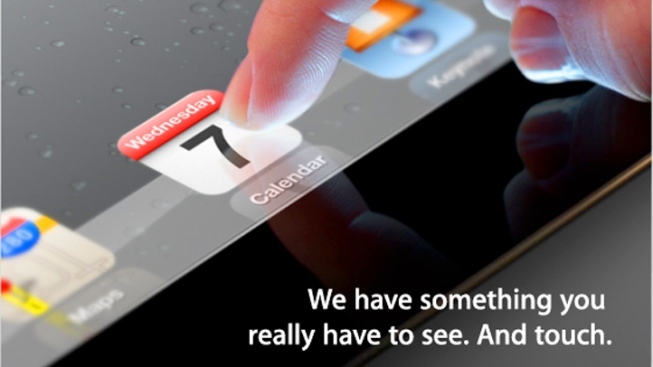 Apple announced the event on Tuesday, sending an invitation with the tagline, "We have something you really have to see. And touch." Although Apple hasn't specifically said the event will be to unveil the new iPad, the invitation shows a finger touching an iPad, and the iPad launch has been long rumored for early March. Apple has given no specifics on what features the new iPad will include, although rumors have included a Retina-display screen, a faster processer, a better camera and a bigger battery.